This flourishing town is situated on Battle Creek, about one mile above its junction with the Elkhorn. It is surrounded by level prairie, better adapted to grazing and meadow than to the raising of cereals, though the soil is rich, and, where plowed, produces excellent corn. 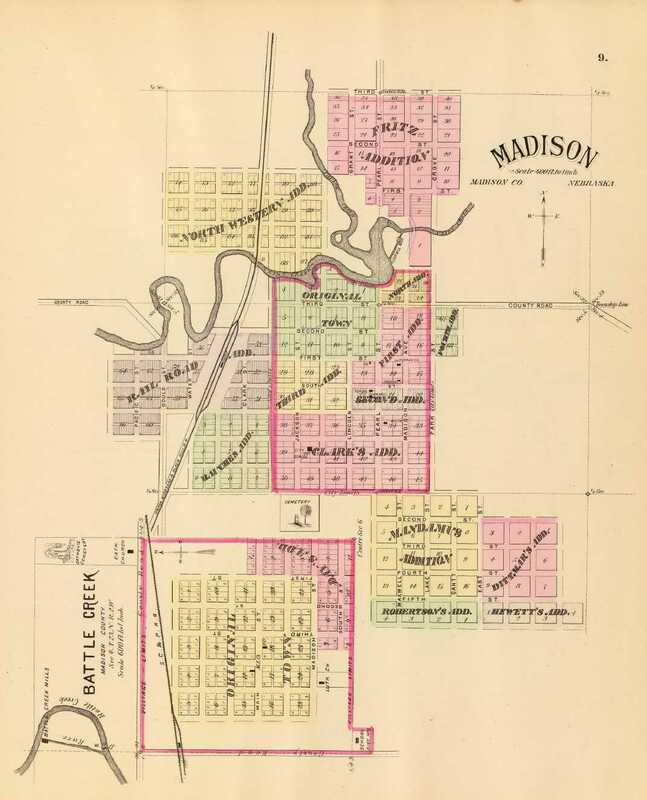 The town site, at the time of the laying-out of the town by J. D. Hoover, belonged to a company, consisting of F. J. Hale, John F. Tiedgen, Hogrefe and P. J. Neil. The first buildings erected were a store and dwelling combined, by F. J. Hale; a hotel, by John F. Tiedgen; a store, by Patrick O’Neill; and another store by J. D. Hoover, all in 1874. F. J. Hale was the first hotel-keeper and the first store-keeper. The post office was established in 1874; J. D. Hoover, first Postmaster. Since this time, the town has made steady progress, until now it contains two general stores, one hardware store, one grocery, one blacksmith, two agricultural implement dealers, one drug store, one grain dealer, one harness shop, two physicians, eighty-six school children and about two hundred inhabitants. There are three churches, Catholic, Baptist and German Lutheran; a fine new frame schoolhouse, 24×44 feet, costing $1,500; and an excellent flouring-mill, 26×36 feet, three stories high above the basement, containing two run of stone, and situated on Battle Creek, one-fourth mile north of the town. Source: Andreas, A. T. History of the State of Nebraska, p. 1109. Chicago: The Western Historical Company. 1882. This is Charles Larson (843) 240-9882. I am the grandson of William Larson and son of Harris Larson, both of Newman Grove. I would like information on where (and phone number) to send genealogical materials regarding Madison County and particularly Newman Grove, NE. Your immediate response is appreciated. Thank you so much.